You're WRONG! 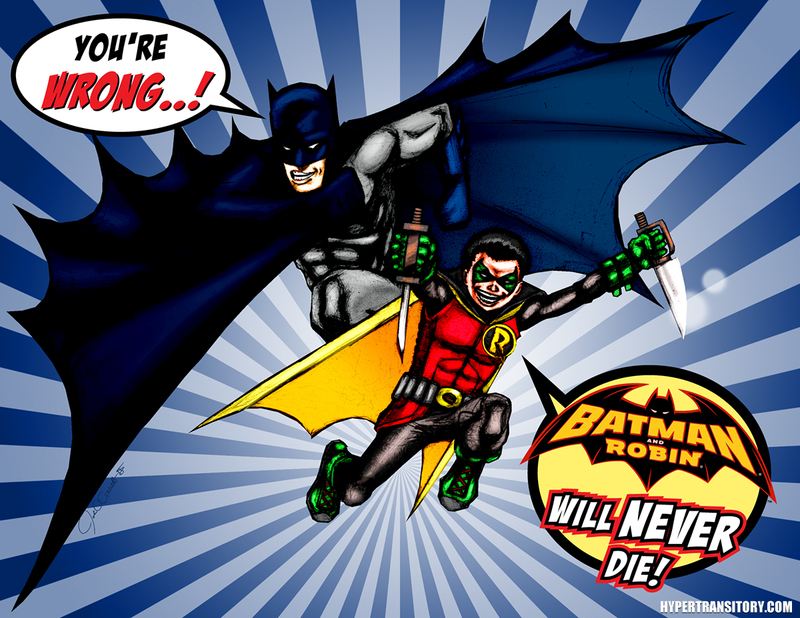 Batman and Robin will NEVER die!!! You’re WRONG! 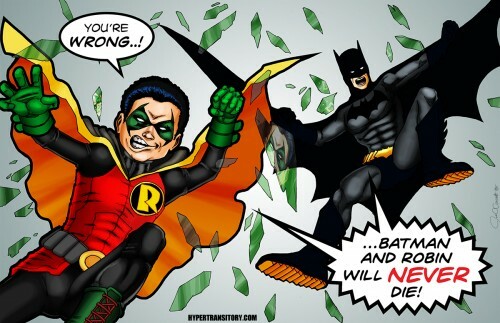 Batman and Robin will NEVER die!!! I worked up some pieces recently based on a particular scene from Grant Morrison run of Batman. Morrison’s writing is kind of hit or miss with me. I’ll start with the good stuff. All Star Superman (Vol. 1 – click here for All Star Superman, Vol. 2 ), written by Morrison and drawn by artist Frank Quietly (I don’t think he has a website? ), is probably the best Superman story fans have seen in years. I’m a fan of the character of Superman, but the stories being told in the main Superman books these days are simply atrocious. I think it’s shameful how awful they are. That’s why Morrison’s Superman story was such a breath of fresh air. This twelve-issue series takes place outside of the official canon of Superman (unfortunately), so the events of the story have no bearing on the main character in the flagship comics. Checking these out right now I see there’s a version called Absolute All Star Superman . It’s an oversized hardcover edition similar to the Captain America Omnibus, Vol. 1 from a few years back. Man I loved that one. I have all the single issues of the All Star Superman, but I’ll probably pick up this one up as well, since it has extra artwork and notes from Morrison and Quitely. With that said, sometimes Morrison’s stuff can go way off base for me. Let’s take a look at Final Crisis, which was a huge company-wide crossover in which Batman was apparently killed at the end. I have to admit, Final Crisis was one that I didn’t fully understand. The basic premise was that the Gods had died and were being reborn on Earth, where they proceeded to take over and just wreck shop on the whole planet. It was a seven issue mini-series. I bought each issue, but I still didn’t know what the [email protected]#! was going on. There was so much lead-in, so many tie-in issues that you would have to have been a millionaire to afford them all. 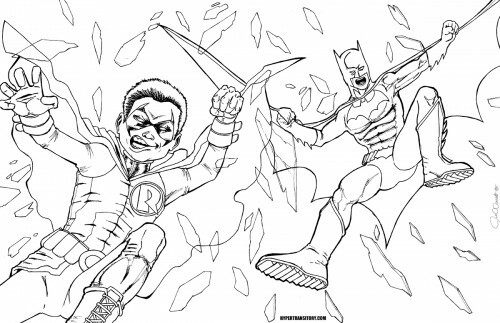 Also, I have very little interest in much of DC except for Batman anyway. Another problem with Final Crisis was that Morrison sometimes goes off the rails with the detail of the writing. He’s obviously very intelligent, but I think he throws in way too much sometimes. You can’t really get everything out of the story unless you share his knowledge of the minutiae of the DC Universe from the 60’s and 70’s. One thing I’ll say is that I think Morrison wants to go above and beyond, and not just provide a standard comic book experience, but many times there’s a reason I read comics, especially super-hero comics, and that’s because I want to see some action and some punching. When I want long drawn out super-complex stories I’ll go read a novel. I’m not a stupid guy but sometimes I’m left wondering what actually happened with this story. When I finished Final Crisis I almost stopped reading any DC at all. 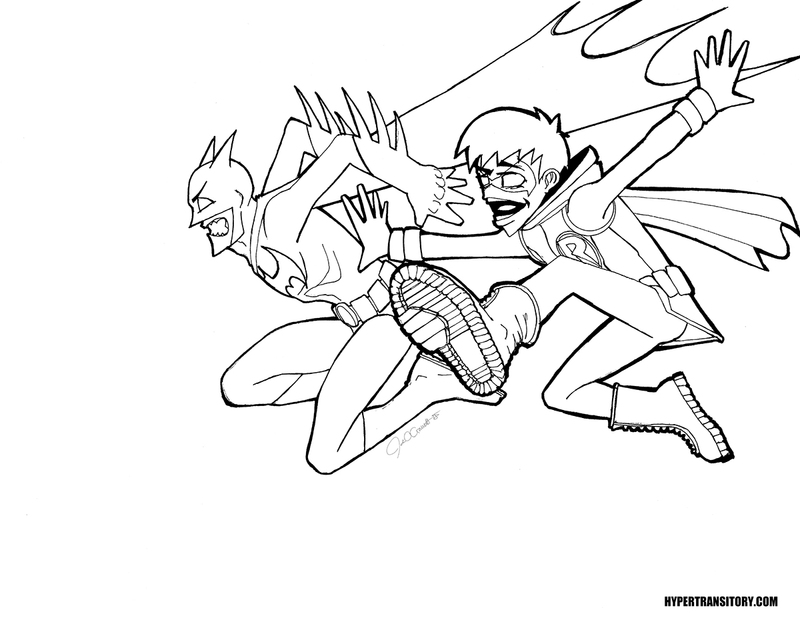 But I wasn’t ready to give up on Batman yet, and that brings me to my art pieces. 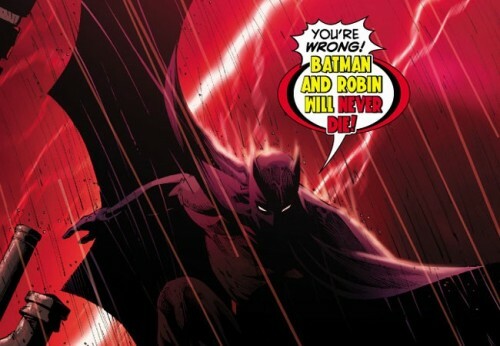 The story started out with a silhouetted Batman and Robin charging toward you yelling out “You’re WRONG! Batman and Robin will NEVER die!”. Then nothing. Nothing to explain where that outburst came from. Of course, by the time you get to the end several issues later you know exactly who, where, when, why and what was happening on that first page. This first one I did in traditional comic book style. I started with 11″ x 17″ smooth bristol, then drew with non-photo blue pencil, moved on to a 6H pencil (a 6h strength pencil is very hard and very light) to solidify the characters, then I inked it over using several different strength rapidographs. I scanned it in and colored it in Photoshop. When I scan inked linework I always scan at 2400 resolution. If you scan linework lower than that you’ll probably find that it gets jagged edges when you convert it from linework to grayscale to color. If you use the “lineart/linework” setting on your scanner, the file won’t be very large so you won’t have to worry. When you convert it to color though, you’ll need to remember to lower the resolution down to about 300dpi or so or you’ll end up with a HUGE file to deal with. So after coloring this one in, I added the text in Illustrator. You can do this in Photoshop but I just prefer to deal with the text and word balloons in Illustrator. I find you have more precise control over it that way. If you don’t have Illustrator it’s not a deal-breaker, Photoshop can do it as well, I just find the text a bit cumbersome in there. The next one I drew on a regular 8.5″ x 11″ sheet of printer paper. Again I started out with the non-photo blue pencil, then continued with the 6H pencil. This time, though, I did not use ink. 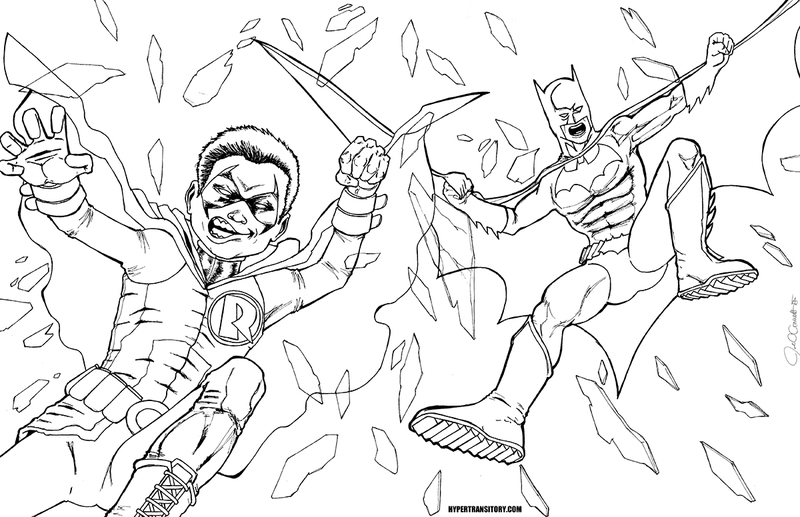 Instead, I decided I was going to color in right over the pencils. I actually don’t care for ink that much, as I feel it destroys the subtleties of the pencil work. However, since I was going to skip the ink, the art was going to have to be a lot darker than a 6H pencil could provide. So after the initial pass with the 6H, I moved on to a 2B strength, then filled in the deep blacks with a super-dark 6B lead. Finally, I went back in to do some shading with the 6H pencil. When it was time to scan, as I wasn’t using the line-art setting (too much shading with the pencil for that), I had to use the color setting (I used color instead of grayscale because I want to capture as much information as possible. I can always make it gray myself in Photoshop, I don’t want the scanner doing it). I scanned it in at 300 for a decent, print-worthy size file. 2400 would have been way too much and made a huge file that I probably would not be able to color with my machine, it would just get to big too fast. So you can tell how this one looks a lot less “clean” than the first one. Which is fine for me, since it’s what I wanted, but doesn’t really work well for commercial printing purposes, which is why it’s not usually done that way in the comics world. Finally, the last one I decided to go Manga with it and change my style a bit. This one was fairly easy since I wanted it to be really simple with not much detail to it. Just flat, bright colors with strong lines. To that end, I went back to ink. I drew this on another 8.5″ x 11″ sheet of printer paper, starting out with non-photo blue and 6H pencil. I inked this one over, and one thing you’d find if you did this is that inking on regular printer paper will allow your ink to “bleed” a little bit, so your lines won’t be as crisp as the could be. This is why they use the heavier bristol board in the industry, it’s sturdier and holds the ink better. 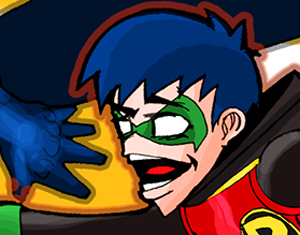 So again, I scanned in and colored in Photoshop. 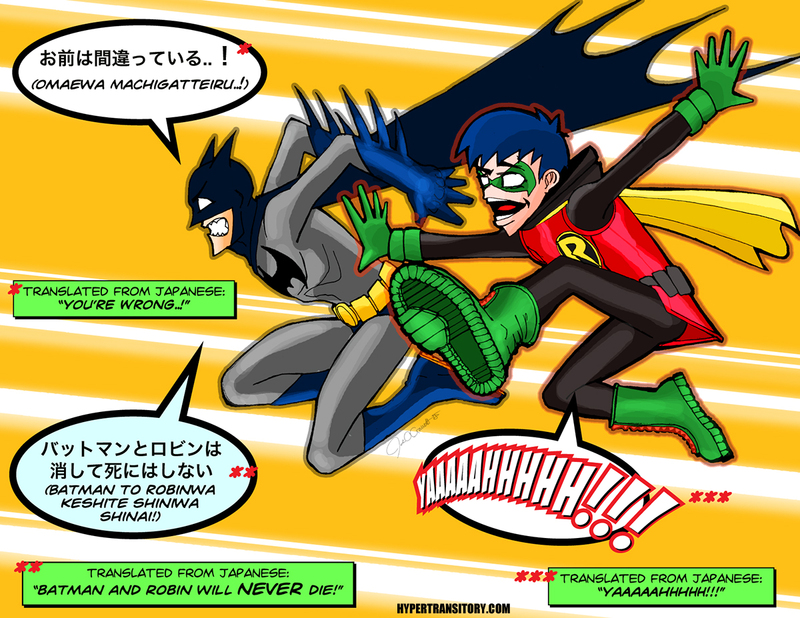 I added the text in Japanese, since I thought it would be fun to include that for a more Manga feel. I don’t speak Japanese, so I asked for help of the Conceptart.org forums. A couple of posters came to my aid and really helped me out. It seemed like there was a bit of a disagreement over the nuance of the language, so I’m still not 100% sure that it says what I want it to say, but I hope it’s good enough. So to bring this to a close, these pieces were essentially a minor fan art tribute to a really great story from Grant Morrison. I’m looking forward to the next phase for Batman, which those of you in the know have probably already read – Batman, Inc. I picked it up and so far I’m pretty excited about this new direction for the character. For those interested, Grant Morrison just did an interview with Wired Magazine about the changes and issues of writing Batman. 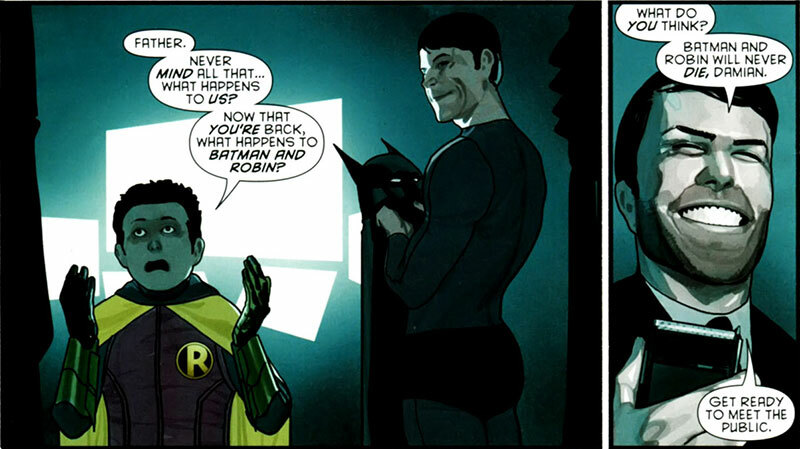 If you’re interested in starting at the beginning of the Morrison Batman run, pick up this trade: Batman and Son . All I can focus on is the fact you used the correct form of “you’re” in your blog post. Given how horrendous grammar can be these days, I salute you. Yo Samuel! I think you dropped by for Fat @SS Friday links before! lol. Anyway yeah Batman is one of the only comics hittin’ at DC these days. Thanks for stopping by! Man I’d love to get my grubby hands on that Batmobile!! That thing looks SWEET. 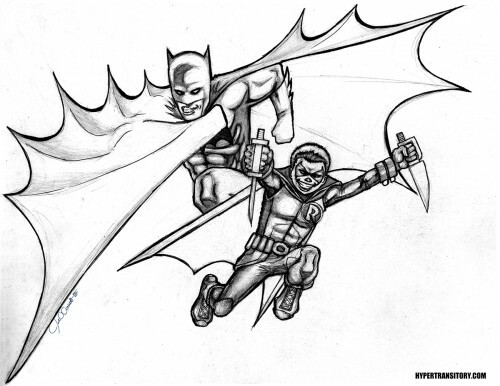 Well, I’m not much of a Batman or comic book fan… But major props for being so talented, John! Way to go! I bet it took a lot of time and effort to get there, and I definitely respect that. Keep it up! Thanks for the compliment Tristan. That’s high praise indeed, my friend! Man, that post alone made me bookmark your blog! Awesome work! You’ve really got talent John! I am the biggest fan of batman since child. Yes they cannot be died because they lives in your heart. no doubt, Rakesh. No doubt. Thanks for dropping a comment, man! It would be a crime against humanity to kill off Batman, the greatest hero ever. i really like the batman and robin combination both are good but batman is the best i really want to be like him…. Yeah Batman and Robin have never been die anymore, I love them both. 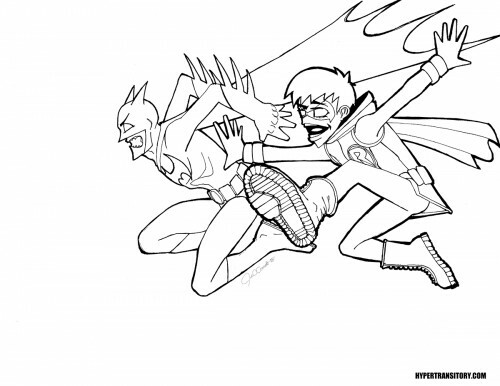 Your drawing about Batman and Robin are very funny, I love it! Batman and Robin are my favorite cartoon hero characters when I was in high school, definitely until now I still enjoy watching them both.